Step 1. Rinse quinoa well in a sieve under cold running water. Step 2. Add to the rice cooker along with the oats, water and milk. Place lid on rice cooker and set the rice cooker to cook. Step 3. When cooked, remove lid and stir (you may need a little extra milk if it seems dry). Step 4. Serve into bowls and top with apples, almonds and a drizzle of honey or maple syrup. You can choose the type of milk you prefer or just use the same quantity of water if you want to go dairy-free. We used apple but you could try frozen or fresh berries, bananas, mango or even dried fruit. You can add a little natural sweetener like honey or maple syrup, or some brown sugar if you have a sweet tooth. You can find more tips on our How to cook quinoa article. I always like to cook some extra quinoa so I can make this Quinoa tabouleh. It makes a great replacement for the burghul. Quinoa goes perfectly well with salad vegetables, especially in this Crunchy quinoa salad. In winter you could also cook this delicious Hearty beef and quinoa stew. It is filling and healthy. Kids will love these Pork and quinoa balls with sweet chilli sauce. They are the perfect finger food for little ones. 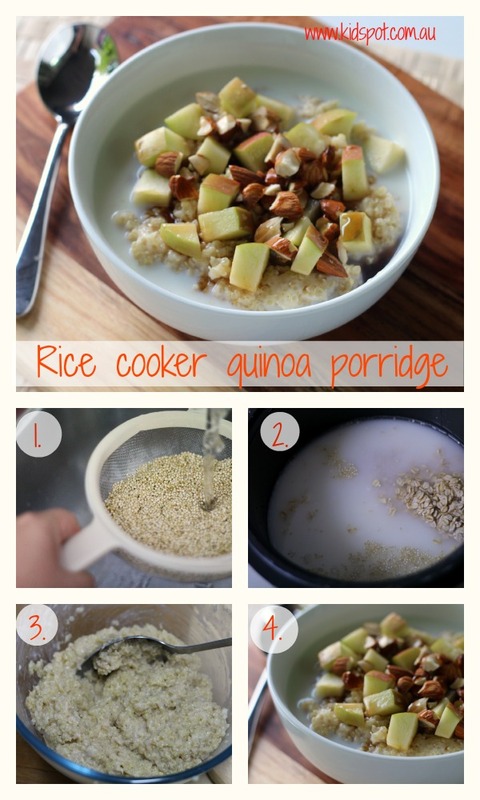 You can try this Quinoa and apple porridge that is cooked conventionally instead of using the rice cooker. You also use quinoa to make this Quinoa fried rice. Just cook and use it exactly the same way you would long grain rice.